Horizon Bird, 2011-2013. Acrylic on canvas, 48 x 48 inches. Passage, 2013. Acrylic on canvas, 50 x 54 inches. Sky, 2009-2013. Archival pigment print on bamboo paper, 16 x 21.25 inches. Edition of 9. Verge, 2009-2011. Archival pigment print on bamboo paper, 16 x 21.25 inches. Edition of 9. Being Ever, 2009-2011. Archival pigment print on bamboo paper, 16 x 21.25 inches. Edition of 9. DC Moore Gallery is pleased to present Mary Frank: Elemental Expression: Sculpture 1969-1985 & Recent Work, which offers a rare opportunity to see major works in clay that established her reputation as one of the most innovative artists on the New York scene. This is the first extensive exhibition of these evocative works in over twenty years. Her recent paintings and photographs bring the exhibition full circle, highlighting the continuity of the mythic, elemental worlds that she has been creating in several different mediums over the course of more than six decades. A catalogue with an essay by John Yau will accompany the show. Mary has said of clay, “It is an astounding medium… so alive and dead, both…It doesn’t breathe on its own, but you can breathe into it and change it.” Mary breathes emotion and insight into all of her work, and the emotional resonance of her ceramic pieces is no different. Using clay in unorthodox and experimental ways, she combined modeling, carving, incising, and assembling in sculpture that suggests the shifting planes of cubist figures, the mythology of Greek gods and goddesses, and a largely feminine sensuality and corporeality that seems to have morphed and merged organically into place. Linda Nochlin, has written that, “Frank’s work speaks to our deepest and most commonly shared emotions, and does so in ways that are entirely unconventional and original, ways conceived through a lifetime of experience and knowledge, yet palpitating with the vitality of immediate discovery.” The range of deep emotions present in these sculptures is impressive – while one is heavy with grief, another figure, Persephone, feels delicate and hopeful. In Three Dancers, the women embody movement and dance in a trance-like state. There is a lightness in how they tilt and sway, in tune with each other, with body and form, and with their birth from both the earth and imagination. 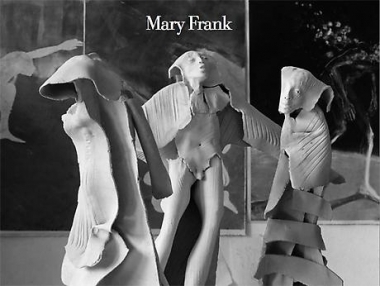 Mary Frank created and exhibited ceramic sculpture from the late 1960s to the early 1990s. 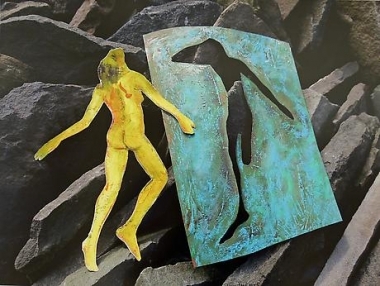 As she increasingly began working in two dimensions, she translated many of the symbolic elements that she had developed in clay into her explorations of new mediums. In the recent paintings and photographs that are displayed alongside her sculpture, certain natural motifs recur in different forms, and the interdisciplinary nature of Mary’s artistic practice can be seen in the shared monumentality of this broad, yet unified, exhibition.